With The Tamir Hendelman Trio (Carlitos Del Puerto on bass, Dean Koba on drums) plus special guest, the legendary tenor saxman, Mr. Red Holloway! We will be playing the music from "You and The Night And The Music"
Thursday, February 14, 2008 VALENTINES! 'Amor' is the word for this evening! This evening will be fine and mellow and cozy enough for snuggling up next to your loved one, or your lovely ones (friends that is) ! Or just bring your lovely self...there will be plenty of lovin' for everyone! Jackie will sing some of her favorite rarely heard romantic love songs from the Great American Songbook as well as songs from Spain, France, Brazil and Italy. Steamers is a great place to hear jazz! Jackie's favorite venue on the west coast! The Bach is a fantastic, warm, comfortable and lively venue with a fun and appreciative audience set on the beautiful Miramar Beach in Half Moon Bay. Food and drink provided or bring a picnic. This promises to be a very memorable day! Please reserve early for this! All profit goes directly to the musicians. The A Frame is a beautiful private home that has had some of the biggest names in Jazz perform there from Russell Malone, Jeff Hamilton, Houston Person, Gerald Clayton to Terry Gibbs. Please join us for a beautiful Sunday afternoon. Two shows: 9 and 11 p.m.
Saturday November 22, 2008 SOLD OUT! 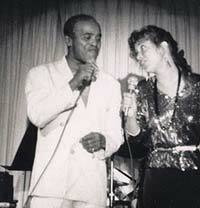 Jackie reunites with the grand master of vocalese, Jon Hendricks and his beautiful and talented daughter Aria Hendricks!! with saxophonist Noel Jewkes, (who played with Jon for many years), John R Burr - piano, Ruth Davies - bass and Deszon Caiborne - drums. This one is sure to be a sell-out so PLEASE get your tickets soon! Tickets $35 reserved SOLD OUT!